The patient had hypoxic encephalopathy that resulted in minimal responsive state. The event was in the end of June 2013. She was not able to move any part of the body arbitrarily and had multiple myocloni. Gaze attention existed, but she was not able to talk. A yes-or-no-communication system was not present; in fact, it was not possible to communicate with her in any way. Especially the last goal wanted to be achieved with Erigo treatment. 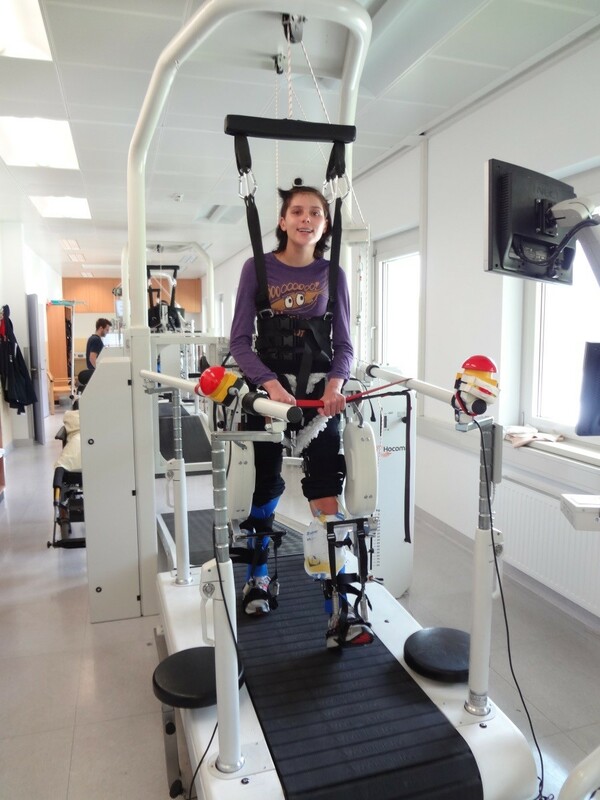 In the last days, she made sudden improvements, so being able to stand and walk became an additional therapy goal. Patient during Erigo treatment at Hospital Hochzirl. She received Erigo therapy for five weeks with short interruptions because of her status of health (e.g. she had short apnoea and examinations, where therapy was not possible). Erigo treatment was done at least 3 times per week, mostly 5 times. In total, she received 18 times Erigo treatment until now. Tilt angle increased from 40° at the beginning to 80° until now. Cadence changing with 24 steps/min to 52 steps/min. Leg loading: 5kg to 35kg. Pattern of stepping: always “Sinus”. Movement and muscle condition: In the beginning she was unable to move any part of the body arbitrarily, but motor function returned in every body part. Head control is present in every direction; upper extremities and trunk are still a little weak. She is able to stand for one minute with minimal assistance. She can do goal-oriented movements on request. Myocloni have strongly reduced. She did not develop any contractures. In the beginning, she tended towards equinus foot on both sides. This could be prevented. Communication: In the beginning, her eyes were mainly closed. She began to open her eyes when her parents were talking to her while being upright in the Erigo. In the second week of her stay at the hospital, she developed a yes-or-no-communication system with her eyes. After three weeks of rehabilitation, she was able to talk, despite of short apnoea. At first, responding was not always adequate, but the sentences became meaningful after the third week. Right now, after four weeks of therapy, she is awake and her mind is present. Patient during Lokomat treatment at Hospital Hochzirl. Would You Recommend Other Patients with the Same Pathology to Undergo Erigo® Therapy? Why? Yes. It is difficult to trace the different improvements to specific types of therapy. But with the help of all therapies, the patient is now able to continue with Lokomat treatment. In the beginning of the rehabilitation, there was no thought of setting the goal of walking. 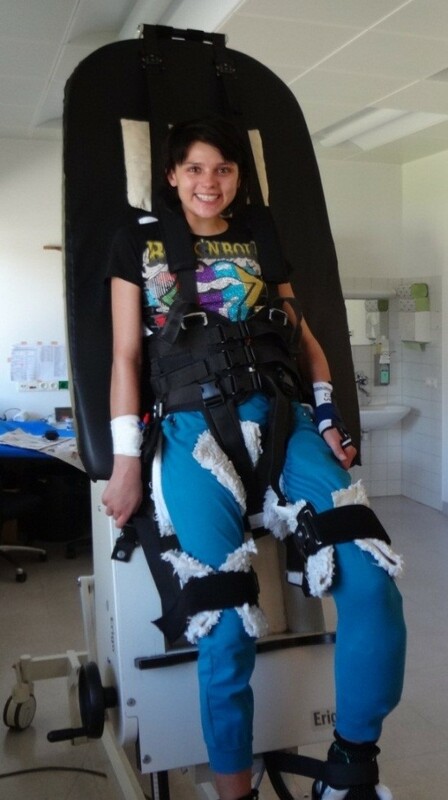 Dynamic verticalisation with the Erigo turned out to help improving her general condition and being a prophylaxis of equinus foot and contractures. Also, the patient gives feedback to be motivated due to the Erigo. Therefore, we are convinced that the Erigo is useful as a preparation for treatment with the Lokomat. Hospital Hochzirl, Department of Neurology, Austria is a hospital for post-acute follow-up assistance for neurorehabilitation. Being established 1995, the patients with various neurological injuries/diseases can be attended stationary with 74 beds. Beside conventional physical therapy, occupational therapy, speech therapy, electrical stimulation and water therapy we provide robotic assisted training since 2002. Specifically, Lokomat, Erigo, Armeo, Amadeo and Hirob are used for rehabilitation of the patients. 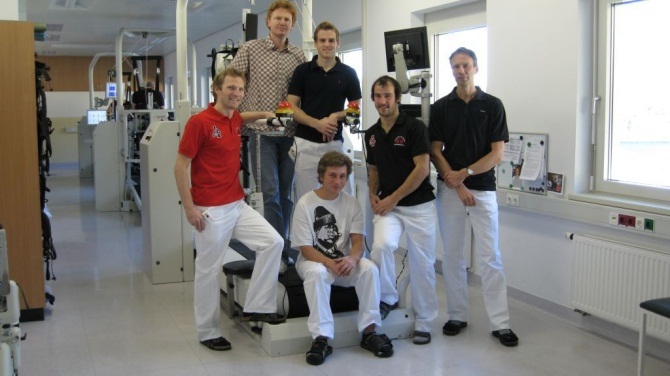 Our robotic team consists of one physical therapist and four sport scientists.